A bright new dawn. A brand new beginning. A new chapter in the Buffyverse. The world has changed. Buffy has changed, but she's "still got [her] demons and still got [her] watcher", so things aren't all that different. Or are they? How much has Buffy changed? She's called "ma'am" now, there are two decoys pretending to be Buffy Summers - who is the real Buffy? "What the hell am I doing?" Who is Buffy now? Is she the head of an army or the charismatic leader of a terrorist cell? What does it mean to be a slayer in this bright new dawn? As Buffy is trying to come to grips with her new role as leader of slayers, she needs to be reminded by Xander to "be [Dawn's] sister", a role she has always been very aware of. She's spent years protecting Dawn and raising her, sacrificed her life for her, but now she's so caught up in being the head honcho of the slayer army. "You're a big girl now." Buffy has grown up and everything seems so different. She misses her home, she misses her mom, she keeps looking for something to relate to. Where is home now that Sunnydale is gone? A brave new dawn (the first panel) VS. A beautiful sunset (Twilight's symbol). The contrast of these two symbols made me go back and re-evaluate the first panel. Is it really a brave new dawn? Or are we actually looking at the sun setting? It's all about perspective. Is it the dawn of a new era or the end? Is the sun rising or is twilight falling? 1) Who is Buffy now? 2) Is this the beginning of something or the end? Who are you now, Giles? Giles is another character who's identity is transforming to this new global slayer dynamic. Giles is the first to introduce this concept for season 8, that slayers don't fight well together. This lesson continues as Buffy takes down her three best fighters without breaking a sweat because they're not working together. Willow continues this line of thought about slayers in Issue 17 stating that slayers don't gain strength from their numbers the way that vampires do. Slayer Identity. Buffy continues to fear the darkness inside of her and how it shapes who she is. She fears the darkness of her slayer side. This continues the question of what does it mean to be a slayer in this new world. Simone Doffler questions this older slayer mentality, asking: "Weapons...how come we have to use all this medieval junk?" Flying. Buffy and her elite 3 are flying in a helicoptor during the first scene of Issue 1. Later we see General Voll flying in a helicoptor outside of Sunnydale. We see Twilight's feet floating (Issue 1) and later Willow flying (Issue 2). Are these two groups comparable? Actions, situations, tricks and traps abound. What you're looking at in the first glance, it's not the real story. There's more underneath the surface. Size does not necessarily equate to greater strength. And even when you're strong, your strength can lead to your downfall. The connection between Buffy and Willow gains a lot of attention. As Buffy's eyes go dark, it makes me wonder 'Is this connection between Willow and Buffy good?' Buffy and Willow both use their inner darkness to fight for good, but eventually that darkness changes you. Is their connection still healthy? What is a slayer? Good? Evil? Are they evil spawn? Are they even human? What is strength? How is it used? Does the source of strength determine if it can be used for good? Hey thanks for putting all that out there. That was awesome. Wow, thanks cheryl. I wasn't sure if my ramblings made sense. I just did a re-read of Season 8 and found a new appreciation for The Long Way Home. Joss packed so much literary meaning and themes in the first arc, as well as amazing symmetry and structure of the story. Plus symbolism, who doesn't love symbolism? There's truly an elegance to the writing that you can see upon a closer reading. Yes, Joss and the team he picked is amazing. ;D You're welcome. I hope we can expect more of your "ramblings". I hated to see it end. I can't wait to see what everything means in the comic and I love to hear people speculate and theorize. Although I haven't read something so well thought out in YEARS. So once again. Thank you. I'm actually getting ready to post my thoughts on The Chain which will take me a little while to get it all down. For some reason, I had nearly as many thoughts for this one issue compared to the entire The Long Way Home arc. The Jo Chen cover addresses two of the main themes of The Chain: Identity and the Subjectivity of Reality. Chen gives us a brilliant portrayal of Buffy, except she's pulling off the mask of her face, tirer la coutour, pulling back the curtain to show us what's real. What's real underneath the mask? Who is this girl? Is this Buffy? Is she a good slayer? The first panel brings us in with the name. The power of that name evokes memories of seven seasons of heroism, human vulnerability and sacrifice. This is Buffy Summers. But wait, what about the mask? Ah, now we're clued in. This can't be the real Buffy. Buffy can't be dying in the fifth issue of Season 8. So what is the identity of this girl who's masquerading as Buffy Summers? What's real? What's the truth? The search for identity continues. Allusions are made that compare the Slayer spell that created nearly 2000 slayers to fascism. This condition that nearly 2000 girls had no choice in receiving. Connection of the many, the unity of the line of Slayers goes into making the name. But the name isn't who you are. We are what we do. Action is *who* you are, what you *do* determines your identity. The choices you make to fight, to walk down that dark path. The name isn't who you are, though names do have power. But ultimately names are just noise. Action is REAL and there is no truth except what you believe. Honorable action comes from self-determined choice, not coercion. And this girl dies not for glory, not for the name. She sacrifices her life to save others. So they may live together, work together, fight another day. Take action not for what others will think or how they will remember you, but because it is good and right. Because you helped. And take comfort in the knowledge that you did good. Only you know the ultimate truth and value of your life. You are the only full witness to your life's deeds. Humble sacrifice. That's what makes a hero. If action determines identity, then who is Buffy in Season 8? A hero? A general? A thief? A queen? A martyr? A tyrant? A terrorist? What does it mean to be a slayer? Are there different kinds of slayers - the true unnamed hero, the rogue criminal hedonist, the indifferent warrior, the detached "big picture" leader? 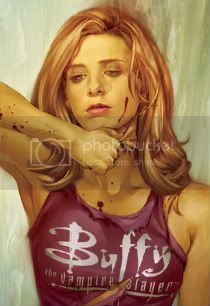 Is this nameless decoy slayer masquerading as Buffy more heroic, more true than the real Buffy? Is the facade more of a hero than the reality? Was the spell to activate all the potentials morally right or was it an abuse of free will? Em, the Buffyfest Bloggers are going to need back-up at the end of November...I really think you should take up the offer (once they do email you, which they will) and post this there. I agree. This would be great on ours site! Perfect timing, too. With the new comic coming out, it will be like a refresher course. Sure. I might want to edit the piece a bit before you post on the blog. Deadline? 'Splainy? From everything I am hearing about season eight, I really want to read it so when season nine comes I won't be behind, but I have no way to read them. Does anyone know where I can find screen-caps of every page or something? Or a detailed summary of every issue? The comic is not legally available in online format. You can get fairly detailed recaps by reading the Wikipedia entries for each of the arcs and one-shots (although there is no entry for the "Twilight" arc yet). The entire series is available in trade paperback format up through "Retreat," and the final two arcs will also be released. You can get them on Amazon and in most bookstores that sell graphic novels, such as Barnes & Noble or Borders. We cannot endorse illegal downloading on the forum, and as far as I know, there is no legal way to read S8 unless you buy it. Amazon.com sells the trades which usually collects individual arcs with the occasional one-shot. Otherwise, Barnes and Noble, TFAW.com, and other vendors also carry the books in one form or another. You can also look on eBay. It seems well written and all but you also seem to have skipped over a few things, namely Xander and his role as well as the B/X storyline. I guess I'm just wondering if the oversight was unintentional or if you really don't see those things as important. drywallman, it's best to notice the date of when this was posted. It's been nearly two years now. What's now more evident about the significance of B/X was decidedly less so back when this was written. Nor is this analysis all-inclusive and touches on every single thing, but is looking more broadly at themes. Within the themes, B/X then would be incapsulated in "connection", but do also consider that this post was written as a conversation STARTER, not a post that offered all the ANSWERS. Emmie/Angeria, I always fully enjoy reading your analysis on LJ. 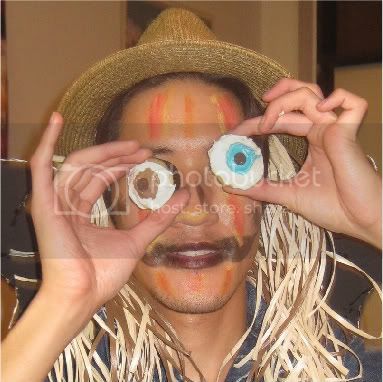 Everytime I see my friends page on LJ updated I sigh with delight at your posts. I hope you know that you're appreciated immensely.